As you may know, I frequent a particular Starbucks to do most of my weekly writing. This particular Starbucks is located at the edge of a beautiful mall in Columbia, Maryland. It is at the entrance closest to a large L.L. Bean and as a result, it is a thoroughfare for tremendous traffic – People entering and exiting in crowds, couples and individuals. Inevitably, over the course of time, people, faces and the rhythms of the mall become increasingly familiar. Though I have few names, it isn’t uncommon to see the same folks throughout a month, some on a weekly basis. There’s the guy from England who sits and reads the paper, and sings Beatles tunes when they come on in Starbucks (I sing with him). There’s the former Arkansas State running back that I wrote of in another post (we saw one another this morning). There’s the woman behind the Starbucks register, whose name means ‘flower’ in Spanish, and her always delightful and smiling co-worker who wears a bandana on her head. There is the guy who wears University of Miami garb while he works beside me at the bar (his daughter graduated from there and we have hit it off). I could go on. And then there are those who work right outside the Starbucks window. 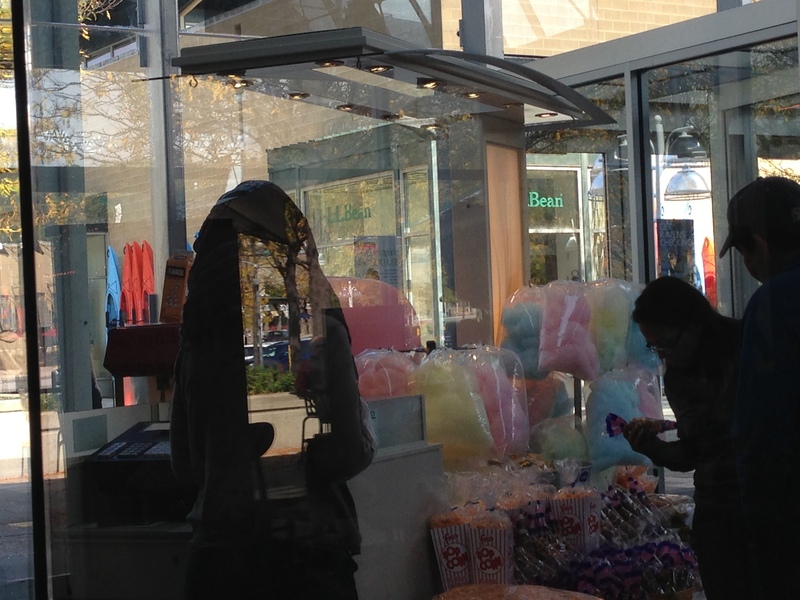 Among these folks is a woman who sells popcorn and cotton candy at the entrance of the mall (she is in the photo in this post, and her face is intentionally obscured). She is always there, always working and moving, pouring powdered butter into the popcorn machine and twirling clear plastic bags of cotton candy. Because of her activity and her wardrobe I rarely see her face, to the extent that until last week I would never have been able to identify her in another context. But now I would. Last week I sat at the ‘bar’ against the window in a spot that was close enough to see her, and I discovered that both her arm and face bear the scars of having been severely burned. And I couldn’t help but wonder what her story is, and I had to work hard not to imagine the worst. Though I’ll probably never know, in reflecting on that moment I thought of one of my all-time favorite bible verses, where in Exodus 33:11 I read that God spoke to Moses face to face, as a man speaks to his friend. I’ve always loved that verse because incredibly it reveals that God is willing to enter into friendship with us, in spite of the fact that we are damaged by the fall. It means something else too, and I don’t think I’ve ever really considered this. It means that when God speaks with us, He sees us – as we are. There is no hiding or pretending. Intimacy demands no less, and God wouldn’t want it any other way. Yet we so readily hide. And normally we’re fairly successful – until God gets in our faces. We hide because we know He sees, only to find that when He comes, rather than express repulsion, He offers friendship. Because He has already accepted and overcome whatever ugly realities define us. Through His Son. Amazingly, the Father recognizes Jesus in our most broken places. And He loves us all the more. And this blows my mind. You are currently reading face2face at unfinished1.